The reason we keep waking up so early is the sunrise is so early here. Like, 4:30am early. What is that madness? Who designed this system? I do not approve. Anyhow, this resulted in me waking up by 6:30am again, which I think will be a pretty common theme during this trip. Our plan for the day was to go and do the touristy things in the city of Tokyo, so we naturally started out by going to the heart of the city: Tokyo station. Apparently it's a popular tourist spot, as far as getting pictures of the building, and the architecture was pretty nice I suppose. It's also where we got breakfast, at one of the only shops that was open. Apparently not many places are open around 9am there. I had curry and rice, because I could, and it was pretty great; Japanese curry seems to be sweeter and far less spicy than Indian curry (at least for breakfast). 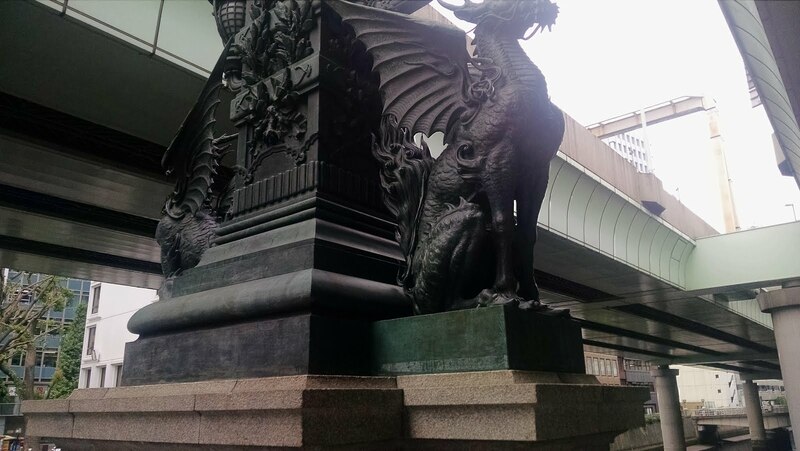 After breakfast we headed off to Nihonbashi, the ancient mercantile center of the city. The bridge there is famous for being where the major roads met, and it has some nice statues on it now. It was also featured prominently in the movie The Wings of the Kirin, a 2011 adaption of a Keigo Higashino novel (like the J-Drama Galileo). Good movie. It's also right next to the Ningyocho district of town, where the 2010 J-Drama series Shinzanmono was set (the movie is a sequel). We wandered around the area, looking at some of the local shrines, and slowly made our way to the Imperial Palace. On the way, we stumbled across the Currency Museum and its free admission, so popped in there. Japan apparently went on and off the gold standard multiple times, with the Yen being worth less gold each time they returned. Originally 1 Yen was worth 1.5 grams of gold! A mythological Kirin, though with wings (which is apparently unusual). The Imperial Palace gardens were closed (as we knew beforehand), so we went off to the district that was the number one place I wanted to visit: Akihabara. If you've heard of it, you know why. 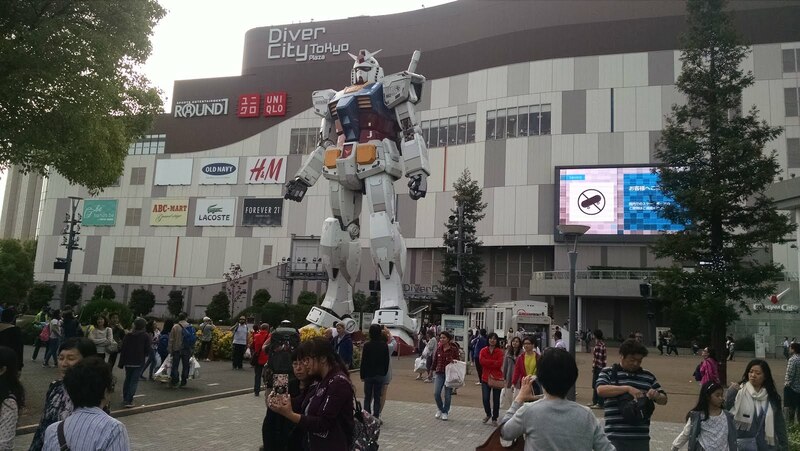 If you haven't, it's basically the geek mecca of Japan. Video games, anime, electronics; they have it all, and they love to show that off. Signs and posters for that stuff are everywhere. Our first stop was, believe it or not, an owl cafe. As in, a place where you can drink drinks while letting an owl perch on you, and you pet it. 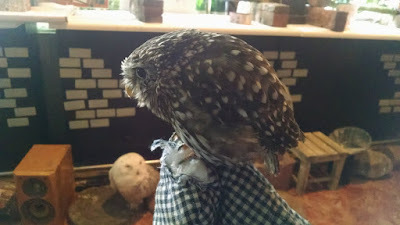 I had heard of cat cafes before, but the owl cafe thing was new to me. Definitely a unique experience. Afterwards, we went for lunch to the other type of cafe Akihabara is known for: the maid cafe. Thankfully(?) it was probably the most chill maid cafe ever created; the staff were in maid outfits, but they didn't call customers "master" or wear cat ears or anything incredibly awkward like that. It was basically just a normal cafe, but with an odd staff uniform. There were no pictures allowed inside either (which is probably a good thing). I got a rice omelet, and no, they didn't write anything on it. Like I said, super chill for a maid cafe. Look at that little guy! His name is Cookie. After the cafes came the shopping, which was the main reason I was hyped to go, of course. 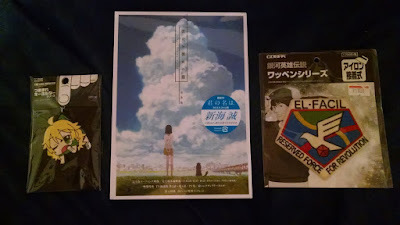 And yes, I did find the one thing I was looking for (and a few things I wasn't expecting, but couldn't turn down). I could spend the whole trip just browsing the stores there though, so we left as soon as I got what I wanted lest we waste too much time. There was apparently a cathedral of the Japanese Orthodox Church nearby, so we stopped in there just to see it and get a brief sit in. There was lots of standing and walking, let me tell you. My haul: Miki is best idol, She and Her Cat, and of course the great Yang Wen-Li. Using the opportunity to have a little meeting, we planned out the rest of our day and headed to Odaiba, the artificial island in Tokyo Bay, to see the Rainbow Bridge and other attractions. 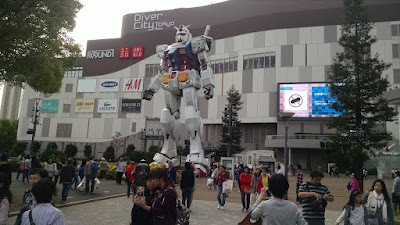 Like the 1:1 scale Gundum they have. And the replica Statue of Liberty. While waiting for sunset for the lights on the Rainbow Bridge to turn on, we chilled in the nearby mall, where we also ate dinner, and I got to eat a Japanese style crepe, where they fold it into an ice cream cone shape and fill it with whip cream. So good. 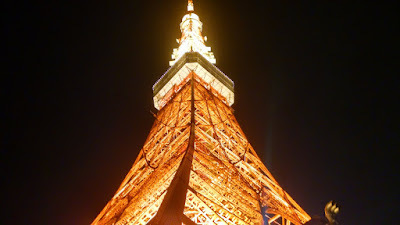 The rainbow bridge failed to light up after dark, so we just gave up and headed to Tokyo Tower instead. It's sort of like the Eiffel Tower, but it's red and white. And in Tokyo. The observatories offered a pretty nice view of the city, and they even had a glass floor section of the 150m level. Not super large, but big enough to make me extremely nervous. It probably wouldn't have been so bad if the lights hadn't been shining right into my eyes from below, making it hard to focus. There's an extra fee to go to the 250m observatory, which we paid. It wasn't particularly impressive, though I don't really regret going up. The view was nearly identical to the lower one though. Maybe when the sun is out on a clear day it's better, but at night there was no real reason to bother. Tokyo Tower, from the very base. A nice effect. By the time we got back to our lodgings, 16 hours had passed from when we had headed out that morning. Also, some 30,000 steps had been walked, covering some 20.5km. I'm not sure I've ever walked that much in my entire life in a single day, and certainly not in the past several years. By the time this trip is done, I'll have met my quota for the next decade, because the next day was a massive count too. We decided the night before that we would head out of the city and go hiking on Mt. Mitake this day. We woke up (early, of course), got ready, and headed out, grabbing breakfast at a cafe on the way to the station. The train ride out there was about an hour and a half, and there was another half hour of travel by bus and funicular up to the start of the trails on the mountain, so it was already lunch time by the time we arrived. We grabbed packed lunches from the 7-Eleven (a much more reasonable thing to do in Japan, trust me; I had chicken cutlet and curry). The hiking was... intense, to say the least. Not all the time, but we pretty quickly went off the easier path and down the steep path that's terrifying to walk on because the slope is steep and there is no safety support, and it's all dirt and rock (some of which is loose)... Really it's standard for mountain hiking, but it still scares me to be on. We went down and up and down and up and down and up... several hundred stories by the end of it all. But the views pretty much made it worth it all. The waterfall nestled in the rocks was particularly nice, though we found out later on (as we climbed back up again) that farther up the stream a (presumably) Shinto ceremony was going on, with nearly naked people standing underneath another waterfall that fed into the one we first were at. It looked... unpleasant. That water was cold. 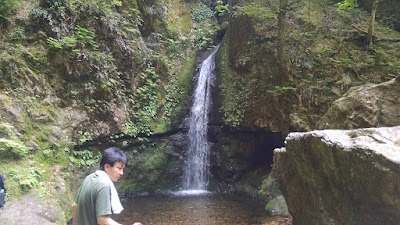 Not the biggest waterfall, but very pretty (and calming) in person. 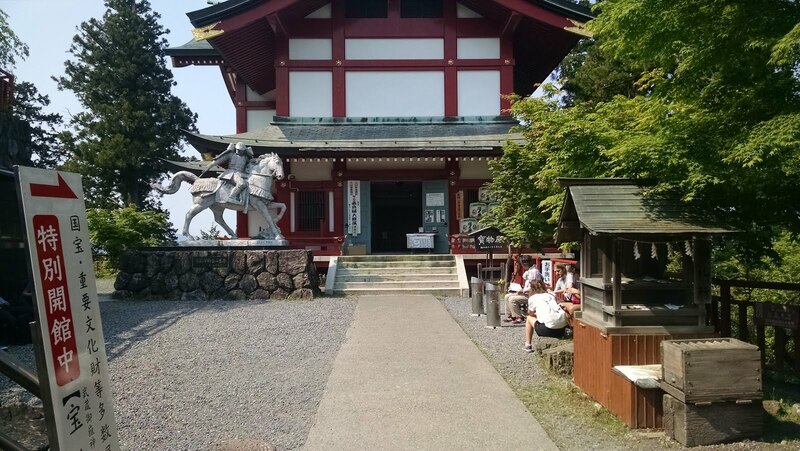 The top of the mountain also has a large shrine that we visited. It was partly under construction, but there were sections that were still regular looking. The whole thing was pretty large and impressive. When we were finished with our hiking at the end of the day, we headed back down; rather than take the funicular again, we decided to walk down the mountain to the bus, which ended up being almost as tiring as the hiking. The road was long and steep and had an impressive number of switchbacks, but we made it down eventually. We caught the train back just on time (the next one would have been in an hour), and finally got to sit again for another hour and a half. The step total for today: over 20,000 across 16km (not counting vertical distance travelled). A very small part of the shrine. Not even the ornate part. If this trip has shown me anything thus far, it's reminded me of what I realised when in London: I love public transit that works. Everywhere I've lived so far hasn't had any really useful public transit system, due to being too small or just not caring enough because they're in North America and everyone expects to drive themselves everywhere all the time. But the transit in Tokyo and London is so comprehensive and so easy that it's not difficult to live without a car there. There are trains that will take you an hour and a half out to a little podunk station in a tiny town, and the one way trip cost under $10! Someday, I'd love to live in a city like those two, if only for the transit.